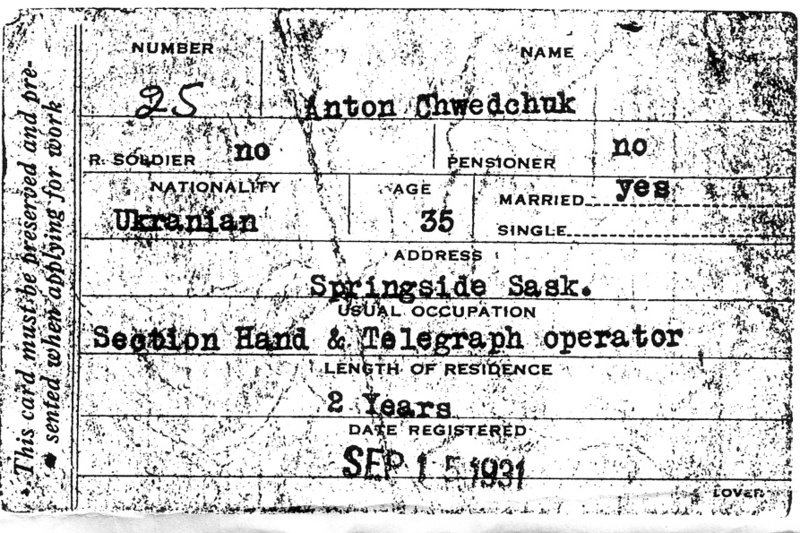 In 1929-1930, Anthony (Anton, Anton) (Tony) Chwedchuk had a job as a hired man with a farmer by the name of Sorenson, Theodore, Saskatchewan. "... 2. 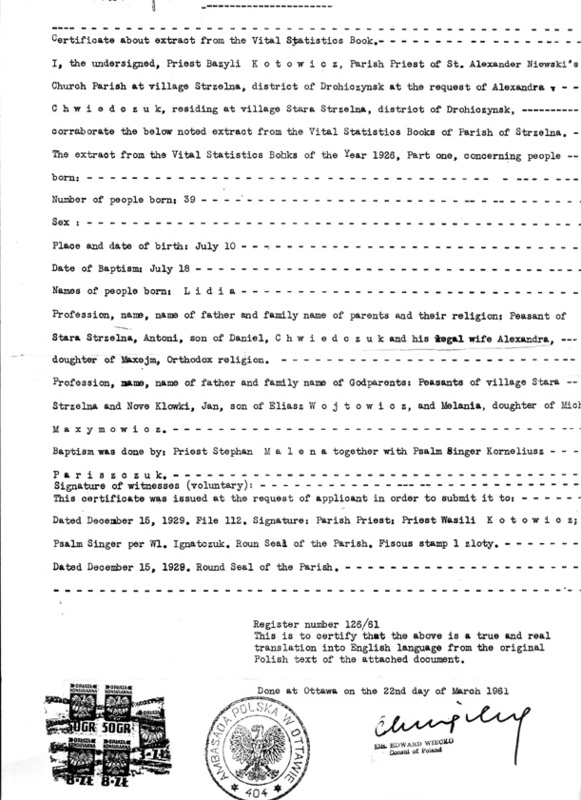 I was born with the name LYDIA CHWIEDCZUK on 10 July 1926 in Poland. 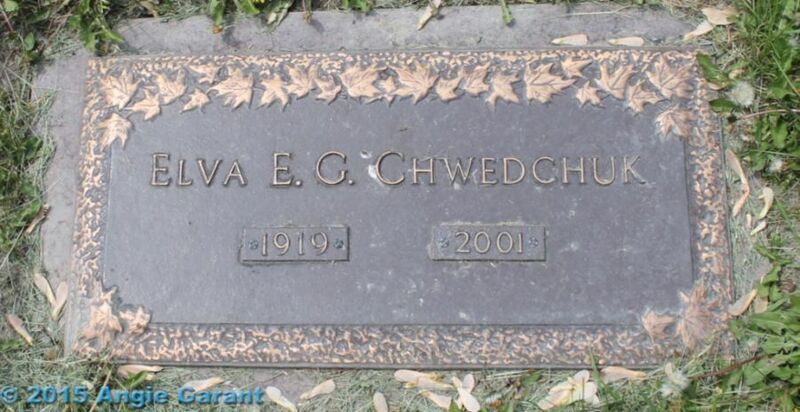 After migrating to Canada with my parents in 1929, I began school in 1931 and since starting school I have always spelled my first name LYDIA and was known as LYDIA CHWEDCHUK. 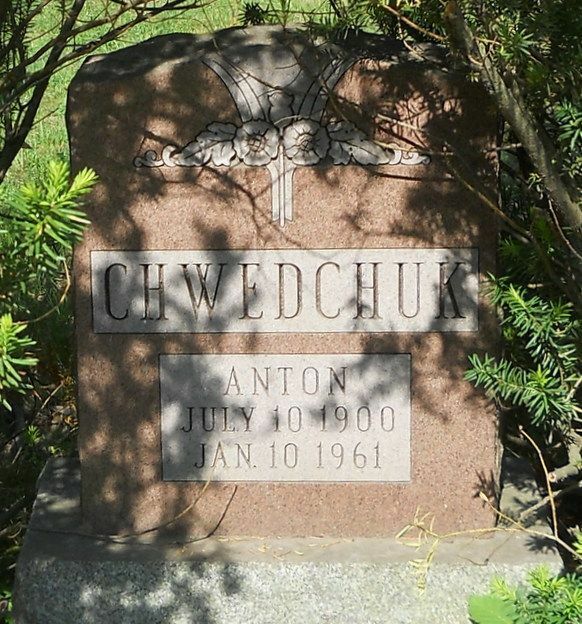 My parents and myself found that our polish name spelled CHWIEDCZUK was too difficult for Canadians to pronounce and so since coming to Canada our family anglicized the polish spelling of our family to CHWEDCHUK. This is the spelling on my Marriage Certificate. 3. 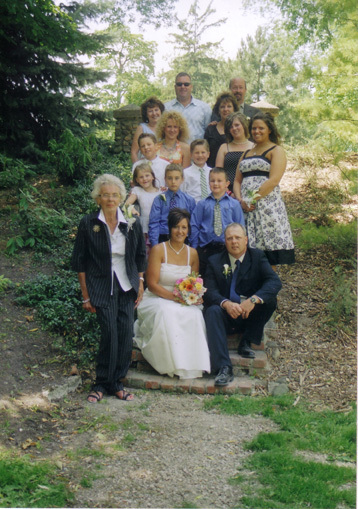 On June 23, 1945 in Welland, Ontario I married the deceased Michael Richards. 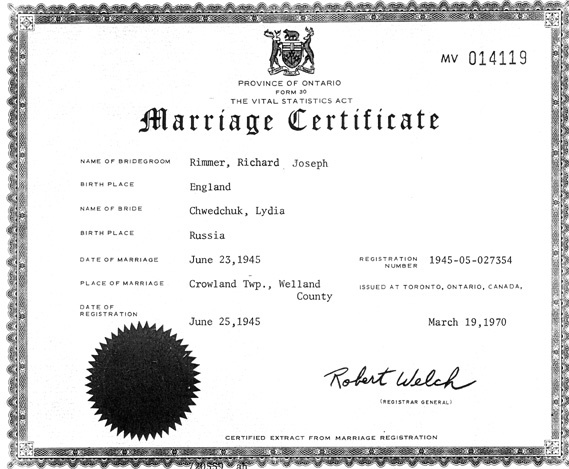 At that time, he was known as Richard Michael [Added in pen: Joseph] Rimmer. This is the shown on my marriage certificate. In June 1947, because of severe family difficulty and deep humiliation my husband moved to Ridgetown, Ontario to get away from his family. 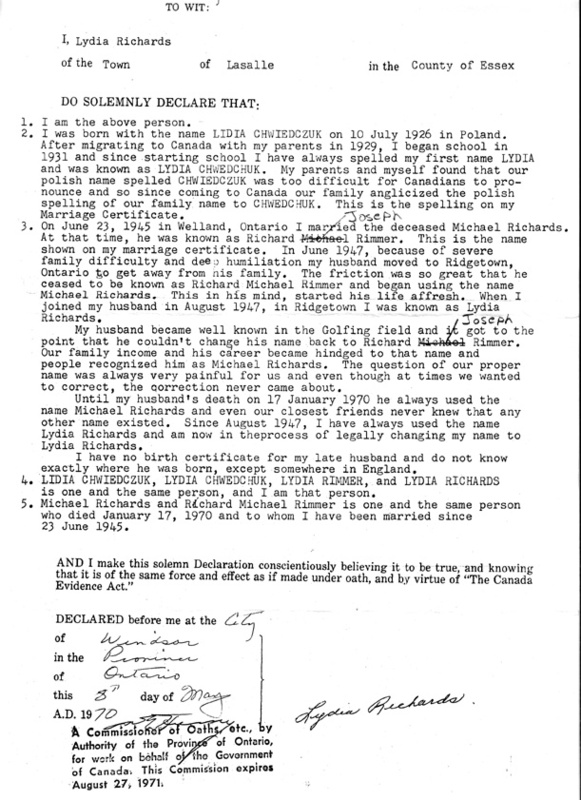 The friction was so great that he ceased to be known as Richard Michael Rimmer and began using the name Michael Richards. This in his mind, started his life affresh [sic]. 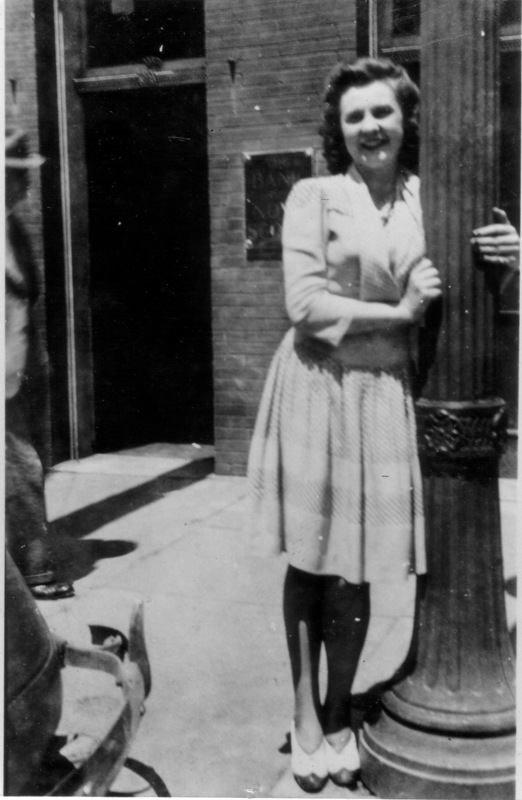 When I joined my husband in August 1947, in Ridgetown I was known as Lydia Richards... 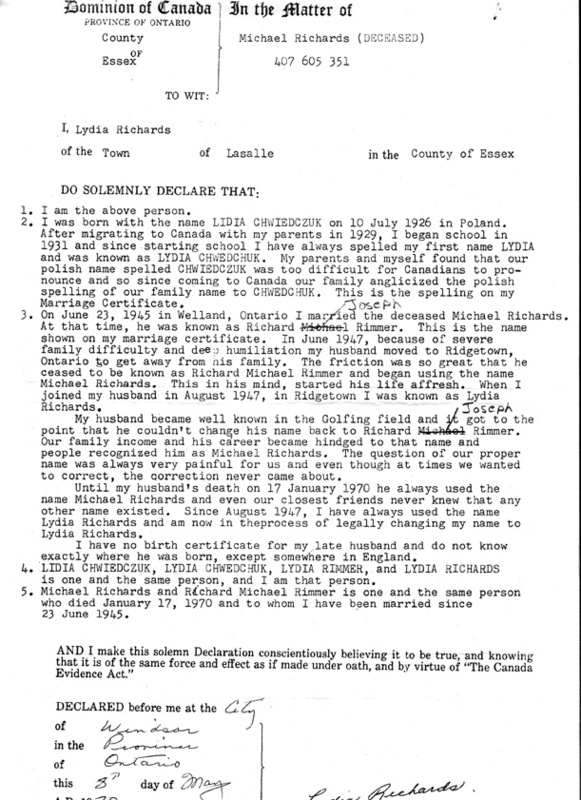 Since August 1947, I have always used the name Lydia Richards and am now in theprocess [sic] of legally changing my name to Lydia Richards ... 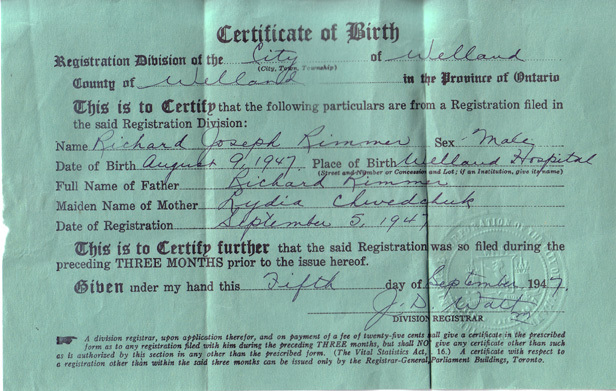 I have no birth certificate for my late husband and do not know exactly where he was born, except somewhere in England. 4. 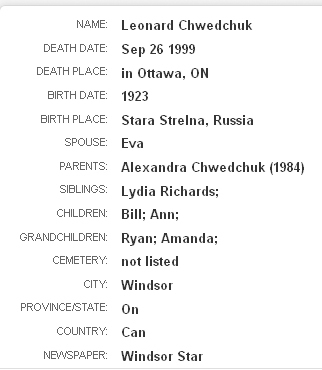 LIDIA CHWIEDCZUK, LYDIA CHWEDCHUK, LYDIA RIMMER, and LYDIA RICHARDS is one and the same person, and I am that person. 5. 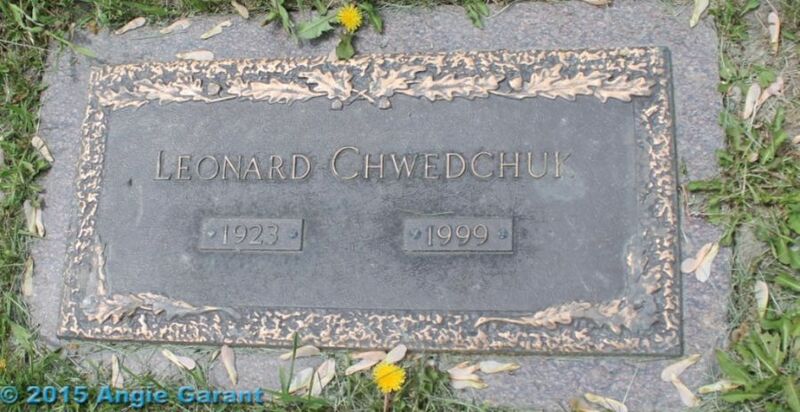 Michael Richards and Richard Michael Rimmer is one and the same person who died January 17, 1970 and to whom I have been married since 23 June 1945 ..."
Mother [of Leonid or Leonard (Leonia) Chwedchuk (February 10, 1923-September 26, 1999)] was anxious for us to have a place of our own for the following summer, where there would be space and buildings for a farming operation large enough to keep her and father busy in their retirement years. So father searched, and that winter found a 30 acre property with a house and a couple of sheds near 3A Highway north of Welland. 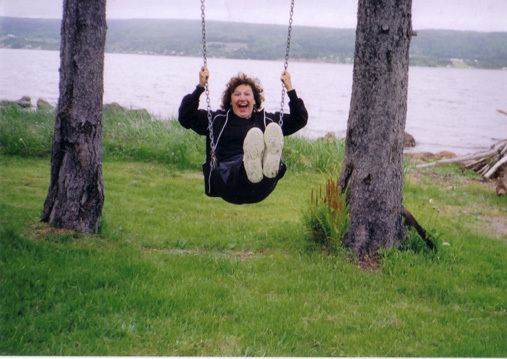 The price was about $3000.00, but with no money for a down payment, father could not get financing from any bank. However, he met John Sidak, a fellow Ukrainian who was prepared to take a chance on getting his money back. He charged 6 % interest, which was quite high in those days. 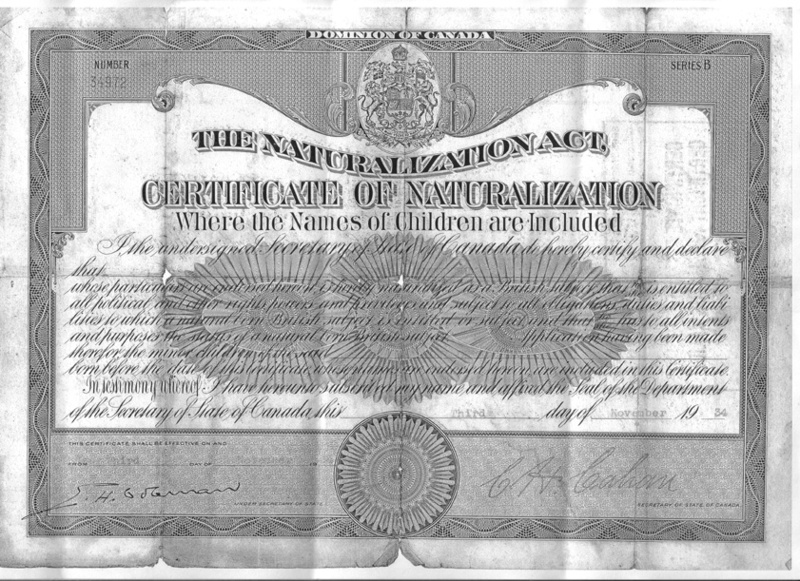 The agreement was duly signed on April 1, 1941, and we moved in shortly after the tenant, a Frenchman named Eli Beaudoin, had found a new residence for his family. The farmhouse was a three-bedroom, one and a half storey wooden clapboard structure built in 1916, with no insulation in the walls nor in the ceiling, heated by an old oil furnace in the basement that provided hot water heating to radiators in each room. It was later converted to gas. There was a bathroom with a tub, which was supplemented with a shower head soon after we moved in , so that father could clean up the grime and sweat more easily after coming home from work. Two of the bedrooms opened directly to the kitchen, but the third one was located beyond the dining room which was on the far side of the living room, in series fashion. The attic was unfinished, and was therefore suitable only for storage. There was also an 80 foot deep drilled well with good water, and a concrete cistern which collected soft rain-water from the roof We had electricity to light each room, a telephone, pumps to provide hard and soft water pressure and another one to drain the sump well. As expected, mother had turkeys on her mind before we were even unpacked, and ordered a hundred or so poults from a turkey farmer in the district. 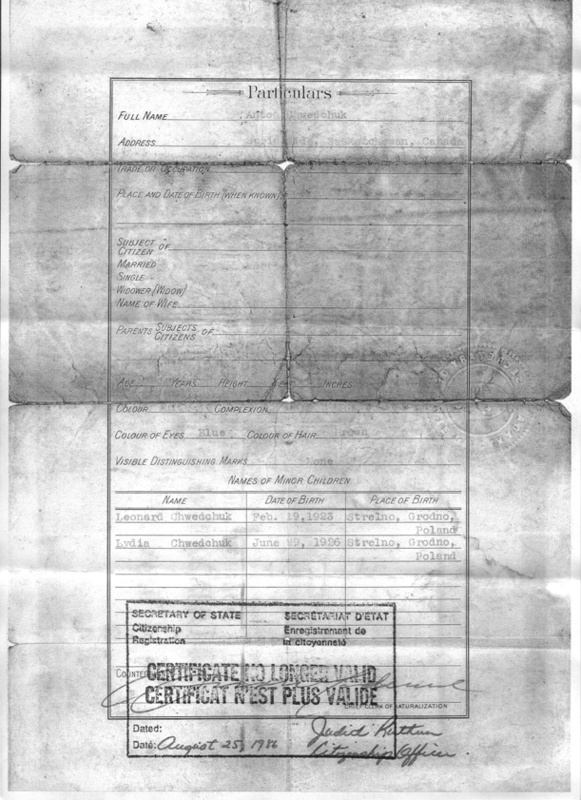 That put pressure on father to start repairs to one of the poultry sheds immediately, find and buy an old car for hauling feed and for driving to work, and arrange for a contract with Purina Feeds to supply feed on credit until the turkeys could be sold between Thanksgiving and Christmas. Unfortunately, the young poults again had to be kept indoors for a month or so, and occupied the living room beyond the dining room. 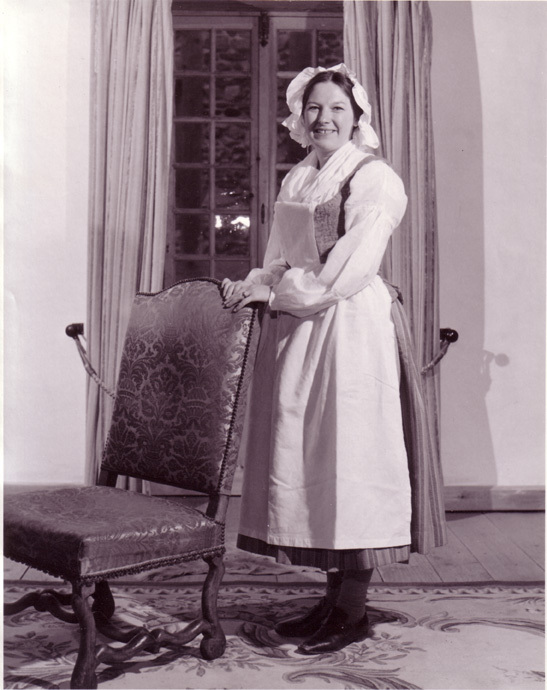 Poor Lydia was assigned to the bedroom beyond that, and had to make her way past the poults ( they were kept within a confined space by a round, corrugated cardboard enclosure ) to get to the living quarters and the bathroom. She was not a bit amused. 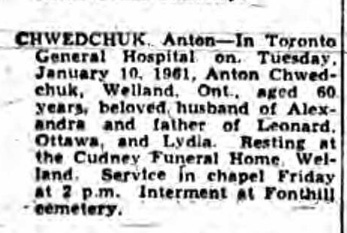 Leonard Chwedchuk, From Revolution to Depression (Memoirs of an immigrant family from Eastern Europe arriving in Canada in 1930) (Ottawa, January, 1999), pp. 90-91.
https://archive.org/stream/queensjournal69/queensjournal69_djvu.txt - Queen's Journal, 1942-1943, KINGSTON, ONTARIO, FRIDAY, SEPTEMBER 25, 1942. 55 ACRES North outskirts City of Welland adjacent Highway 3A. 6 room house, new cattle barn 65 x 35, pens for up to 150 pigs and 1,500 turkeys. Water and hydro all buildings. Some asparagus and fruit trees. Excellent market area. Good opportunity for enterprising farmer. 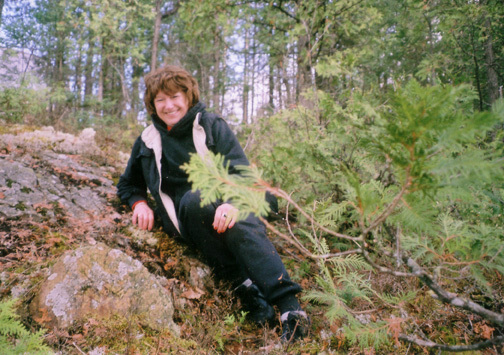 Write Mrs A. Chwedchuk, General Delivery Welland, Ontario. Canadian poultry review, Volume 85 (Donovan Ltd., 1961), p. 86.